thanks — and donate to the NYT campaign! Wow! I’d like to thank everyone who has donated to the SpreadFirefox New York Times advertising campaign via my blog or personal prodding. When I first set out to refer people, I never expected this kind of response! As well as my blog entry, I spoke to a lot of people via AIM, as well as emailed a lot of my friends, and also a University of Chicago email list, where this would be considered on-topic discussion. The response I got from people was amazing. I even posted in the pair.community newsgroup hosted by pair Networks, my web hosting provider. People were actually excited to open up their wallets and contribute to the campaign. A lot of people who were marginally interested became interested when I mentioned that their name would be included in the ad. This is one marketing campaign that Mozilla has got dead right. I swear- I have already gotten four emails about this same thing, all originating from you. Just wanted you to know that word is getting around. Another thing that amazed me was the sheer number of people who were using Firefox, had heard of Firefox, or had friends or family using Firefox. I spoke to a lot of people, and only one didn’t know what Firefox was. More on this will follow in a later blog post. If you haven’t already donated, then donate today! Get your name in the first Mozilla community funded advertisement. An important reminder. When emailing friends, be sure that they are your friends, and not random people whose email you’ve email you’ve harvested. When emailing lists, make sure that sending an email about the NYT campaign would not be considered off-topic or inappropriate for that list. It’s great to let people know about Firefox and the NYT ad campaign, but don’t spam in the process! UPDATE: Looks like I’ve become a Community Champion. Thanks again for your support! UPDATE 2: The goal of 10,000 names has been reached! Signups have ended. If you try, you’ll get an error. Neat! 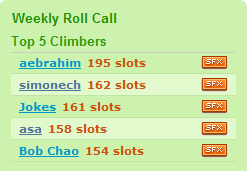 I just got into the Top 5 climbers (right at the bottom heh).